I'm Daniel Nowicki and I live in Dortmund, Germany. I'm currently finishing my studies in information technologies and robotics at our local University for applied sciences. Since I was a little boy monorails have fascinated me. Wuppertal is "just next door!" In the mid-1980s they installed the SIPEM-Track at Dortmund University (in this time I was still in school - but this fact didn't stop me to ride it anyway!). After the "Abitur" (exams young 18 & 19 year old adults take after 12 to 13 years of schooling), I started my studies at Dortmund University. Using a monorail became something very usual to me (maybe in the same way the people in Seattle or Wuppertal get used to it). 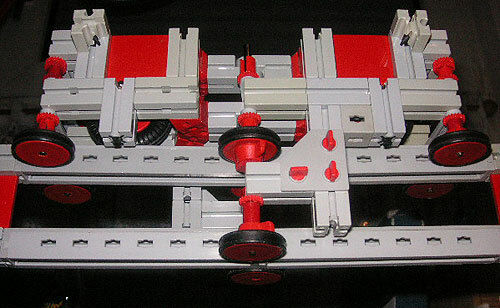 In the practical robotic lessons (of my studies), the "FischerTechnik" system was an often-used tool for development and programming (because it's easy to build up a huge prototype in short amount of time). 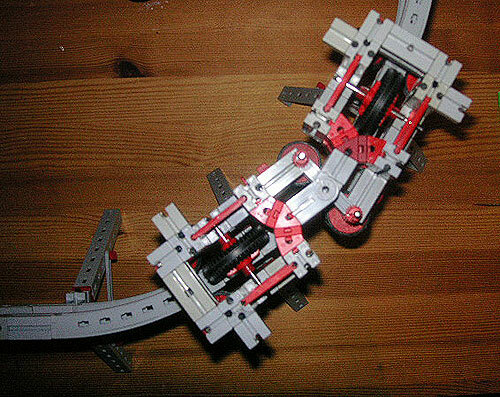 So I rediscovered my beloved toy from childhood (Robotics with "FischerTechnik" really rock! Forget "Lego-Technic," that is for babies!) 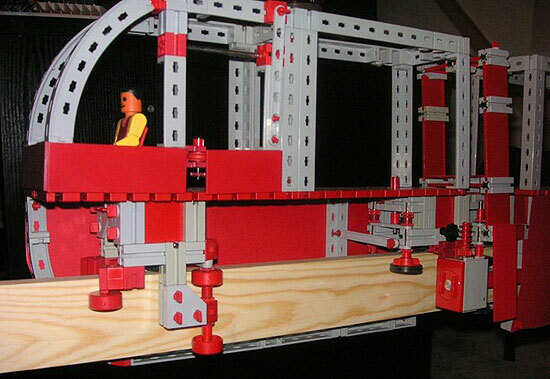 and so I started the idea to build an automated monorail. Since the SIPEM here in Dortmund was already a "Diplomarbeit" of a student some years earlier, I thought it would be better to start with a different (not suspended) monorail system: the ALWEG! I don't know how well known or popular "FischerTechnik" in the USA is, so I'll tell you a little bit about my favorite "construction material." For 40 years here in the EU (especially continental Europe), FischerTechnik has been one of the most advanced and popular "toy"-construction-sets. Even in the early 1980s there was a computer-interface with software and wiring for the various home computer-systems available at the time (Apple II, Commodore 64, Amstrad CPC, etc.). That made the construction of large and complex model-machines possible (trucks, railroads, CAM-sites, large open-cast mining-equipment, the NASA-crawler!). For more information visit the official FischerTechnik website. There are still some things missing/to do in my car: passenger-seats, pneumatic-driven doors (+ compressor), lights, pantographs, destination-display, remote-control system and some other electronics. Also I'm still considering the design of the train-heads: should I change it to the Hitachi box-style front with evac-doors or should I keep it "Old-School" with a large panorama windshield (like the Seattle-cars)? The track-gauge itself is 15mm (millimeters, from the same reason the McDonalds quarterpounder in the EU is called the Royal TS) wide and 60mm high. 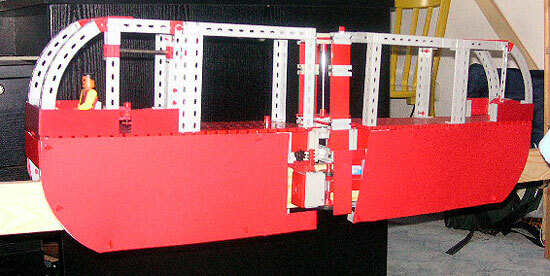 The bogie-design is partially derived from the Disney and Hitachi trains. That means that the end-bogies (with the single carrying axle) are Disney-like, the center-bogie with the engines is a mixture of both: Disney uses two single-axle bogies per car, between the cars the opposing bogie are connected with a kinematics lever witch make the bogies drive proper in curves. Hitachi on the other hand use dual-axle bogies in their modern cars which are fixed (carrying wheels aren't guided separately) and short wheel based. 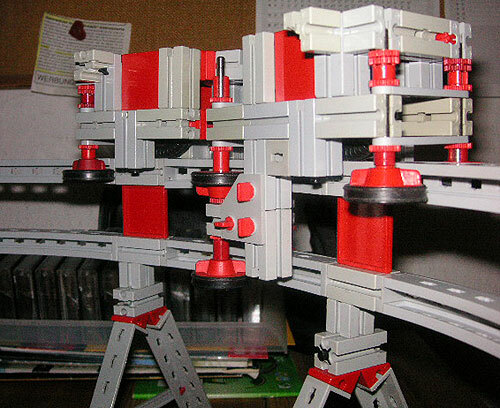 I put the two different technologies together and created my own dual-axle "self-squeezing" bogie. By the way, it also uses less stabilizing rolls than Disney (8 instead of 12), but two more than Hitachi!